Whenever I shop at a TJ Maxx, Ross, or Marshall’s, I always check the books section because occasionally I stumble across a good cookbook bargain. 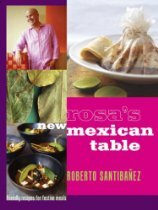 On my most recent visit, I found a copy of Rosa’s New Mexican Table for just US$7.99, and knowing the restaurant’s reputation and the book’s James Beard Award nomination in 2008 I was eager to try my hand at some of the dishes from Chef Roberto Santibañez. Rosa Mexicano opened with acclaim in New York City in 1984, an upscale restaurant with authentic Mexican cuisine and a focus on fresh innovative flavors. Rosa now has eight locations in New York City, New Jersey, Washington DC, Maryland, Atlanta, and Florida. Santibañez was culinary director from 2002 to 2007 and now works with Maria Maria Restaurants. Filled with enticing photography, the book starts with a section on ingredients, equipment, and techniques, and provides helpful information on the types of chiles, both dried and fresh, used in Mexican cuisine. One important tip tells the reader to toast the chiles before using, which helps break down the skin and adds more layers of flavor. The equipment list is short: cazuela, comal (or cast-iron round griddle), molcajete, and tortilla press, and the book offers tips on where to purchase as well as suggestions for substitutions. 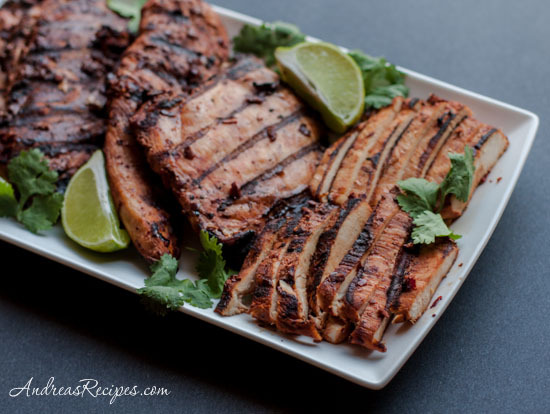 Chapters on starters, tacos, enchiladas, quesadillas and torta, ensaladas, main courses, sides, and desserts provides plenty of inspiration for a complete nuevo Mexican meal or party. The book has recipes for a number of restaurant favorites, including flautas de pollo, alambre mexicano, budín de pollo, and the signature guacamole which is prepared tableside in a molcajete. Sample menus are scattered throughout, directions are straight forward and easy to follow, and many of the recipes can be doubled or tripled and made ahead for party planning. The tone of the writing is geared towards helping readers to understand that preparing high quality Mexican food is well within reach of the average home cook. For our first dish we prepared the Adobo-Marinated Chicken (Pollo Adobado), which we grilled and served in quesadillas, tacos, and atop salads. The dish was very easy to prepare and full of flavor, one that you can serve for an easy weeknight meal or for a weekend party. Even my picky boys enjoyed it. Mexican cuisine is one of our favorites and we’ve already started a list of dishes we want to try: slow-cooked achiote-marinated pork, poblanos stuffed with spinach and goat cheese, pozole, slow-braised boneless short ribs, and the brownie tamales. Rosa’s New Mexican Table flavors and accessibility will keep me coming back for more.